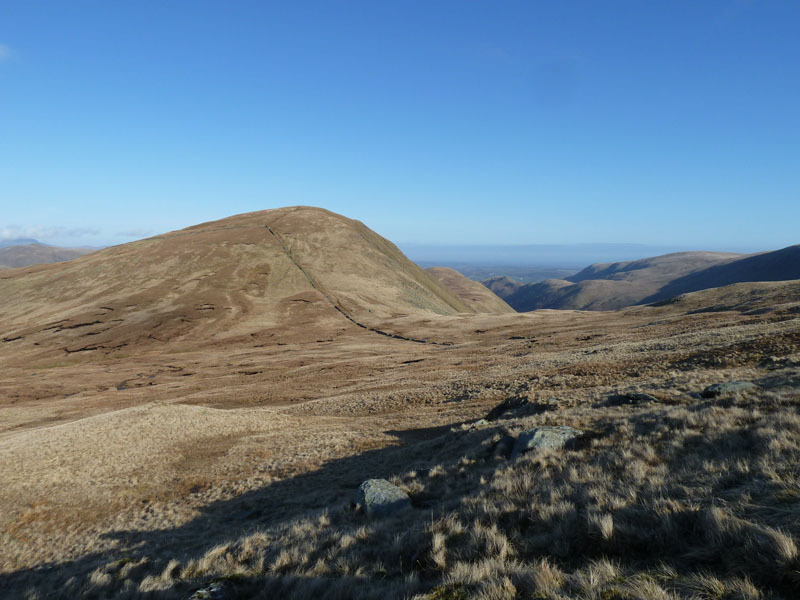 A journey that began at Mardale Head in 1976, unknowingly starting the Far Eastern Fells on Harter Fell, is in line to be completed on High Raise, almost 35 years later. 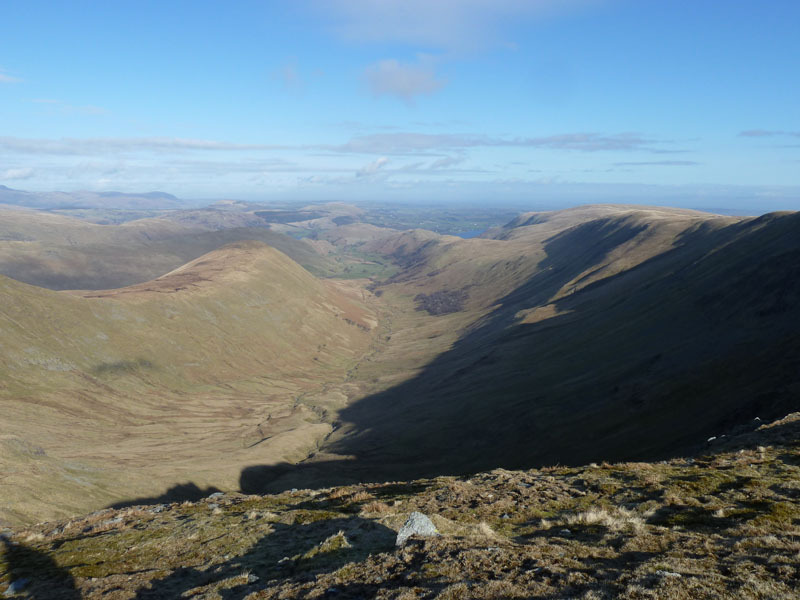 David Hall planned the route, Neil Haselwood joined in and we completed the walk with more walkers than we set off with. Another walk from the door of the tent. It's 07:20, I've had bacon and eggs and my boots are on. Tent zipped and camera on, what about that view then? 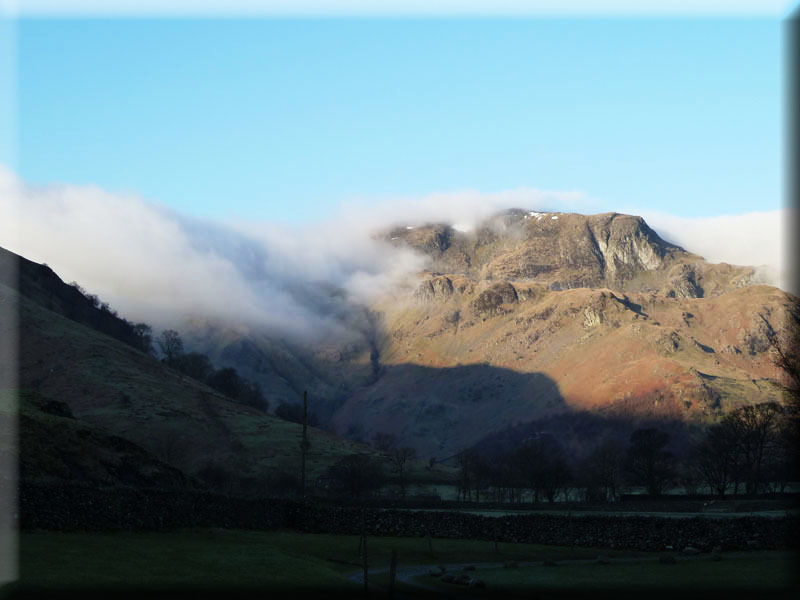 Cloud rolling over from Scandale, there was a light frost overnight. 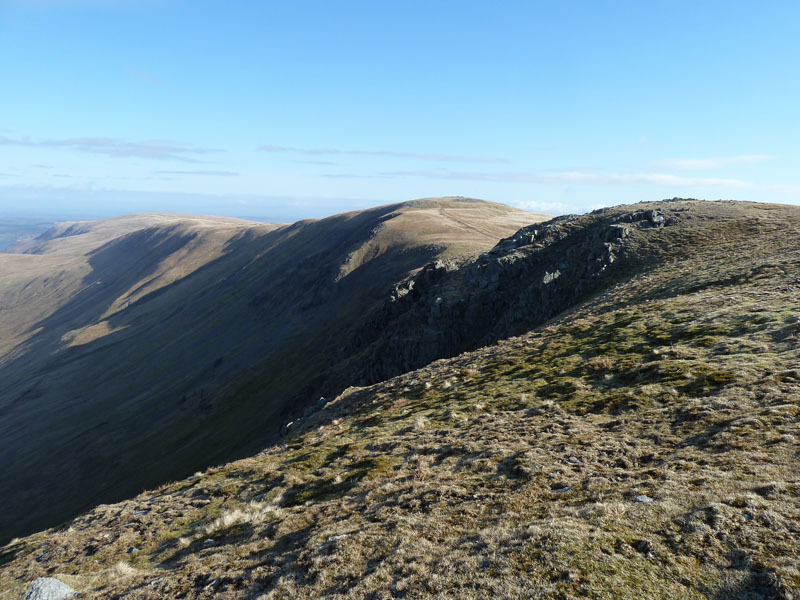 Remember there's wild campers right up there in Priest's Hole on Dove Crag. 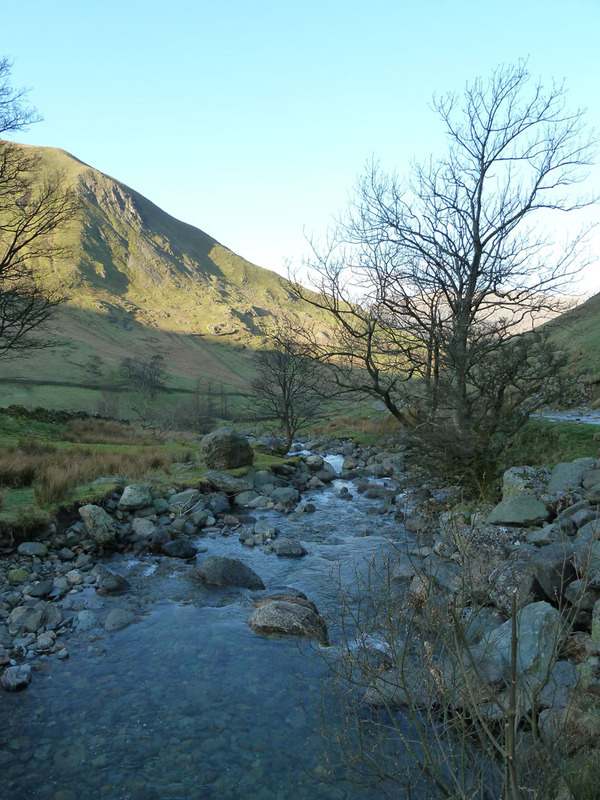 Originally I was going to walk directly to Hartsop to meet the others, but on a morning like this, it had to be the woodland path on the far side of Brotherswater. 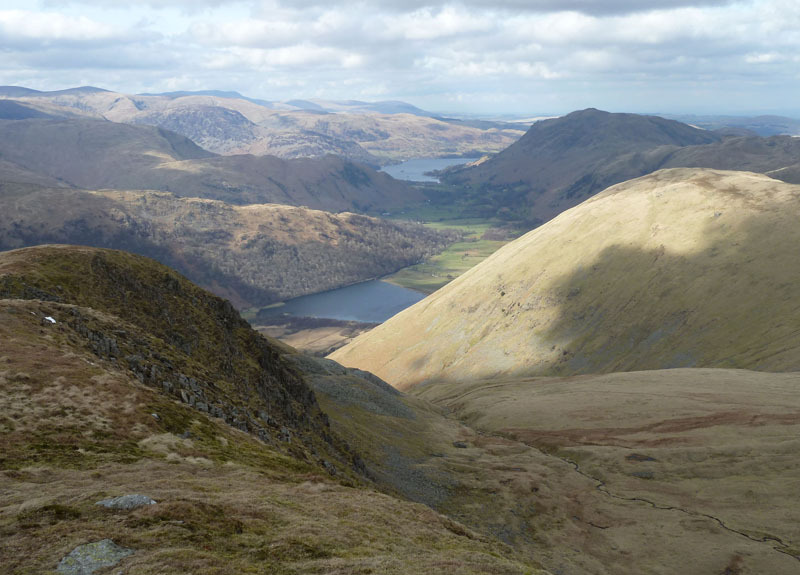 The shadow of Hartsop Dodd lies across Hartsop above How. Pushchair friendly, leads to Cow Bridge car park. 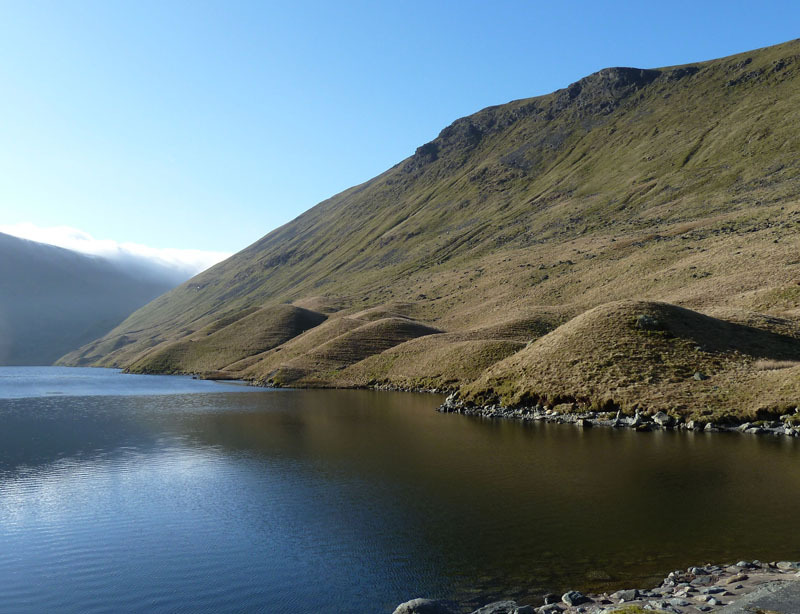 A slight breeze is stirring the surface of Brotherswater and frustrating one photographer who has set up his tripod. 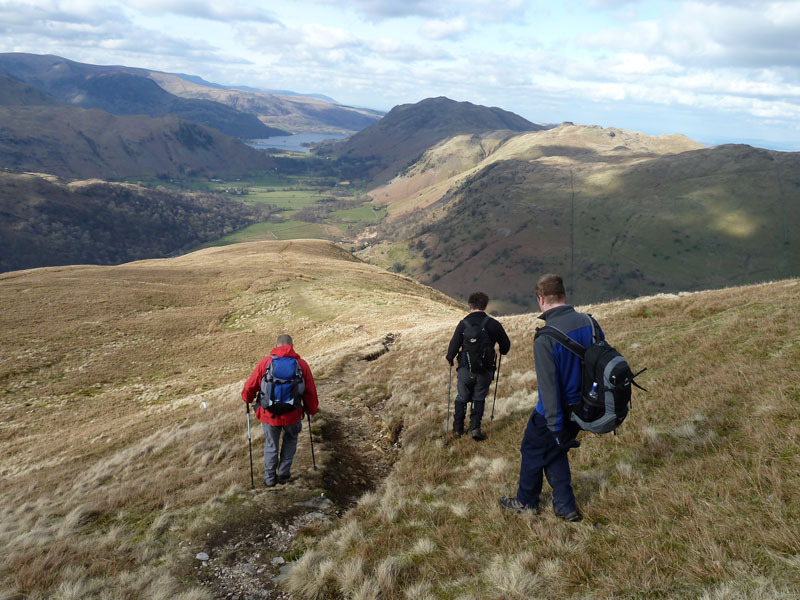 I walk to the village of Hartsop, meeting David and Neil. 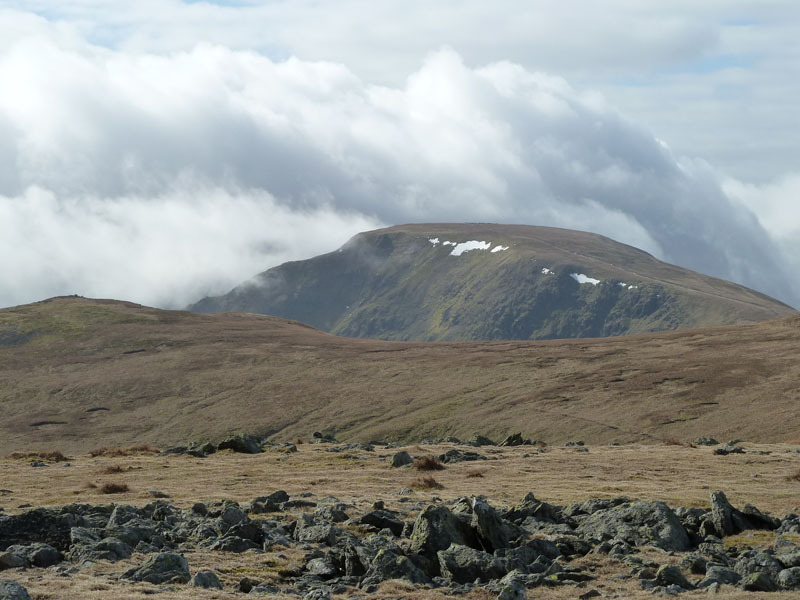 Cloud sits on St.Sunday Crag, Cofa Pike is visible and Fairfield is hidden. 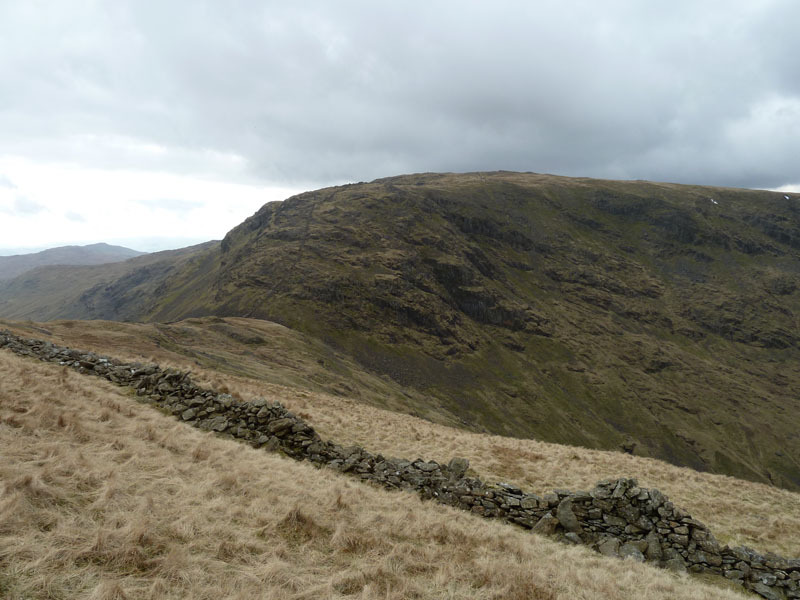 Glacial deposits in the form of lateral morraine line the shore of Hayeswater. 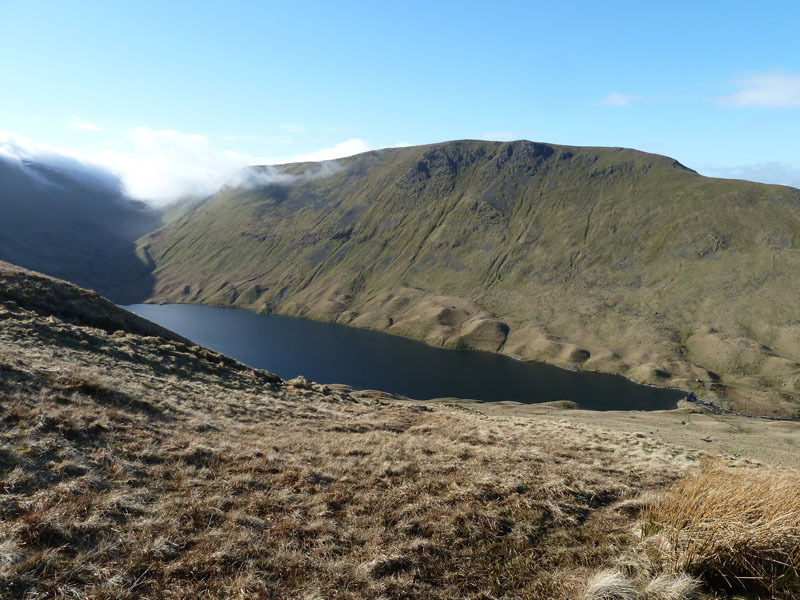 Gray Crag on the far side of Hayeswater, we are heading up The Knott. 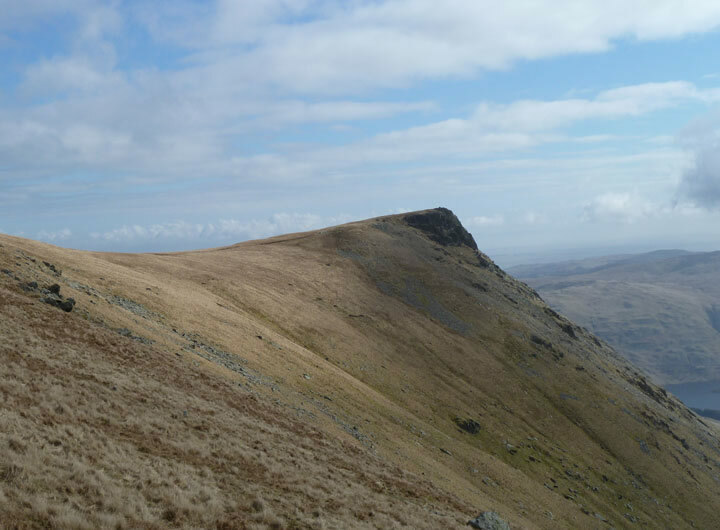 I've been on The Knott before, but it is insignificant as a climb when approaching from the east; this is the right way to do it. Shadow puppetry: Neil plays himself and I've made a camel. 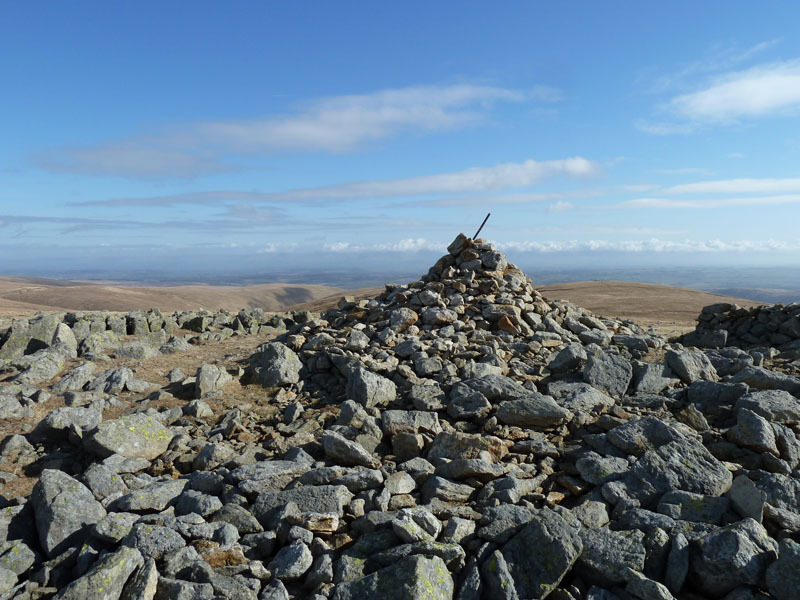 A disproportionately large pile of stones for this particular fell. 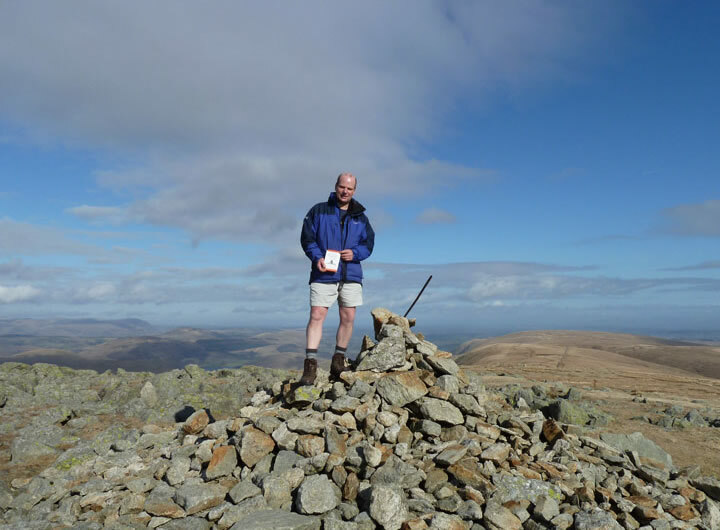 Puzzled enquirers have asked how come I've not been to High Raise before? 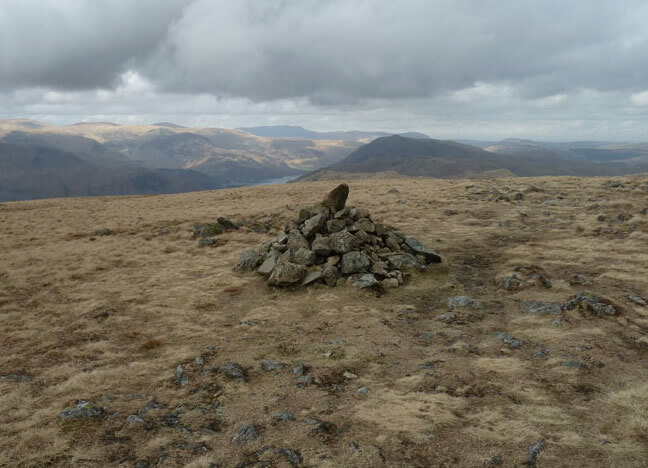 Well I reached Wether Hill from the north and Rampsgill Head from the east on previous occasions, but for good reasons didn't reach High Raise on either walk. That's the big book done. 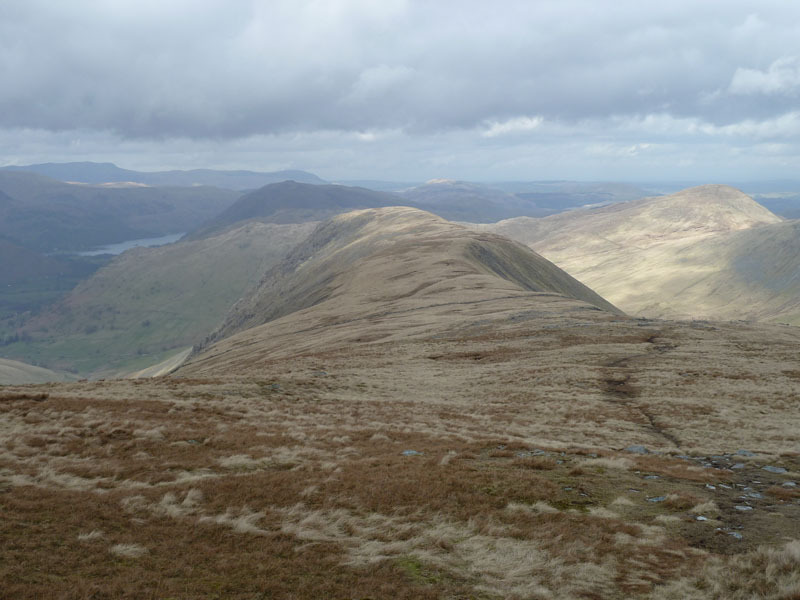 I can still remember the day my dad took us up Harter Fell, water level low in Haweswater. Smashing! 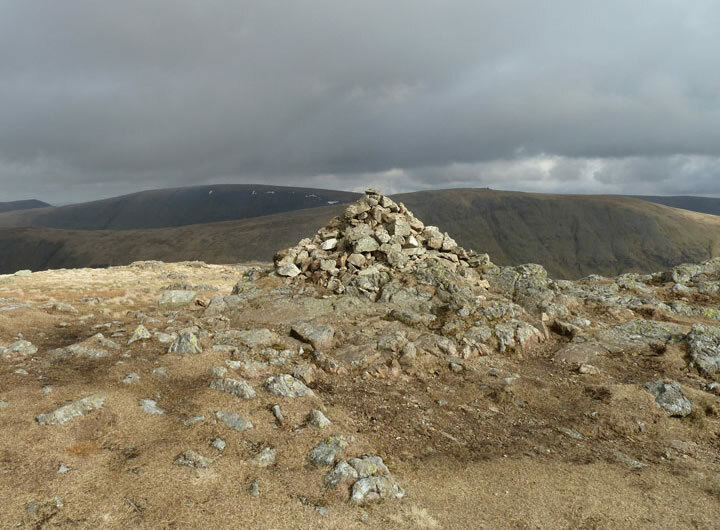 Summits are coming thick and fast at the moment. 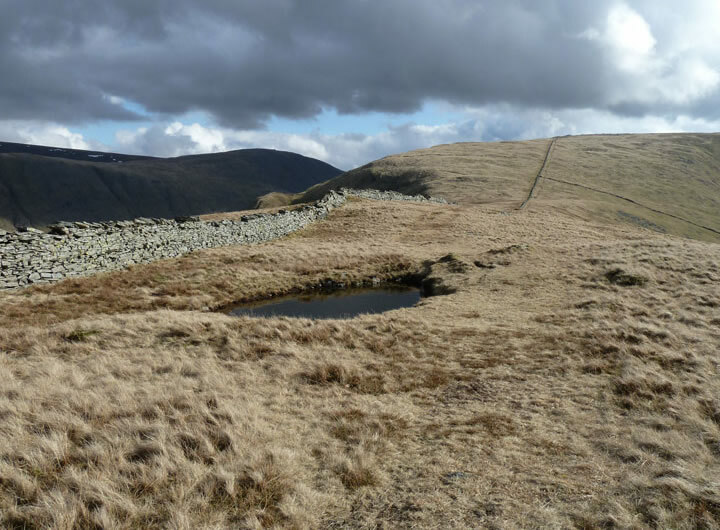 We walked along the shortcut to Kidsty Pike, just visible. David and Neil got engrossed in talk of databases and I tailed behind, humming tunes to myself. You can see how the cloud is pestering the mountain tops. 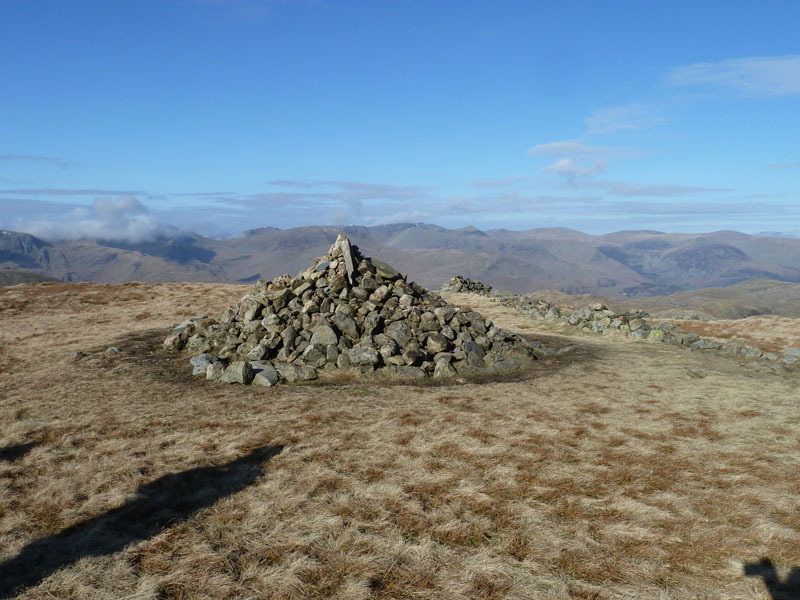 The rocky outcrop is known as Short Sitle. 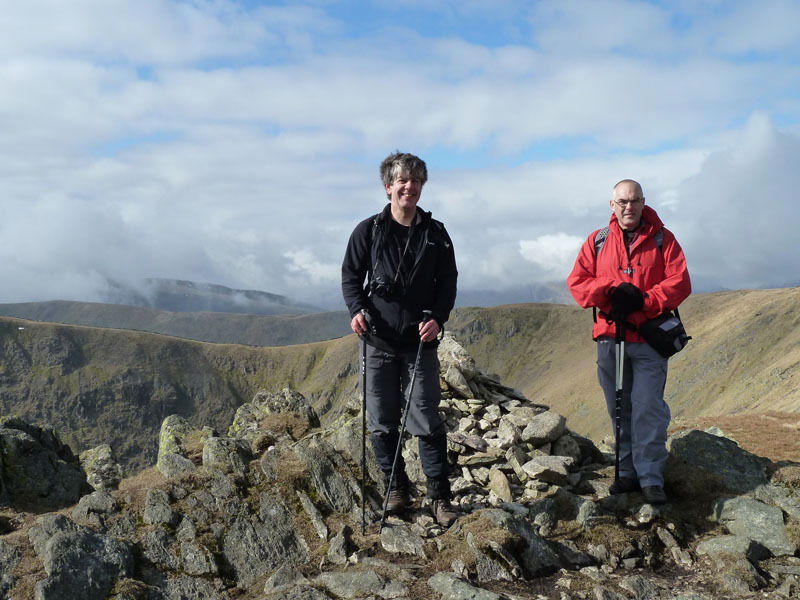 Neil (l) and David on felltop four. We walked on the left side of the wall, I cannot really understand why anyone, Roman or not, would do otherwise. 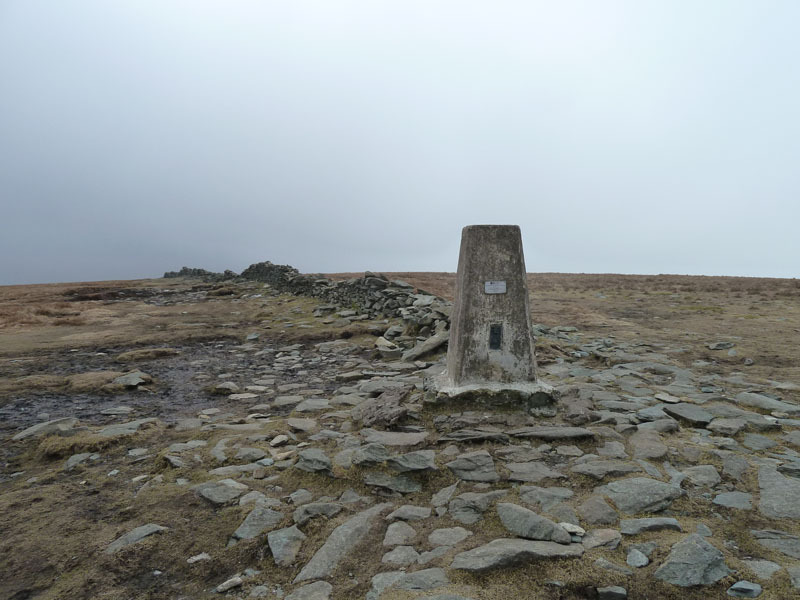 This is the trig with the notice warning against vandalism. It rather tempts miscreants to scratch the sign. It's grey just now. It's about now that we started meeting people. 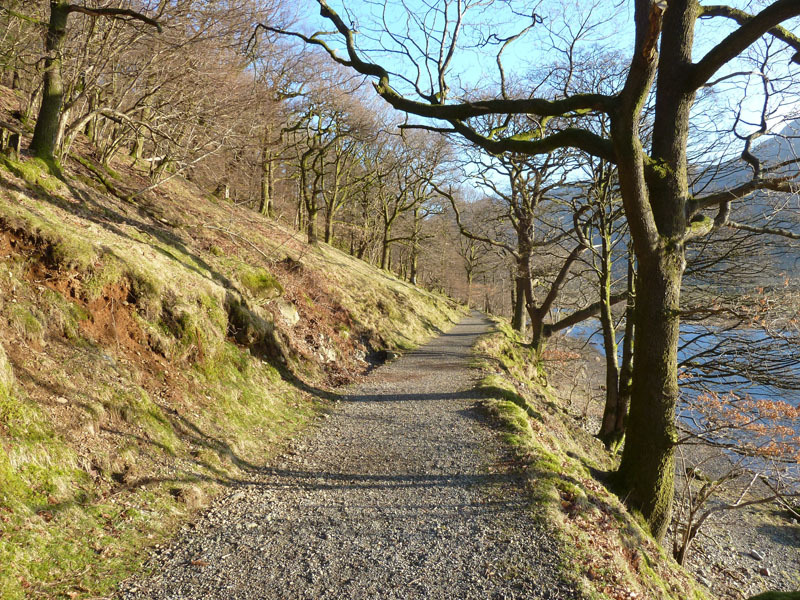 A meeting point of many paths. 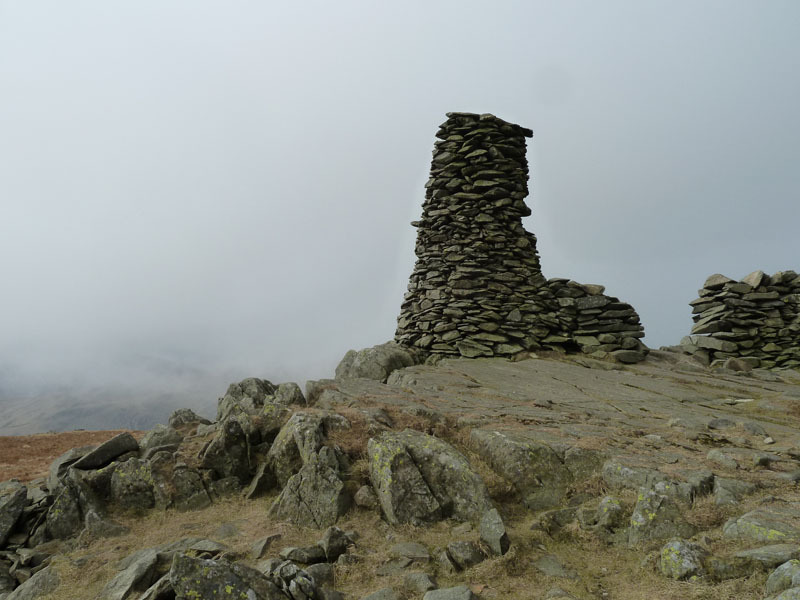 Our plan is to do an out-and-back to Gray Crag; my only previous time on Gray Crag was in dense mist and no visibility, so this was like a new fell to me. Lunch was taken in the dip, behind a wall. The entertainment started here. 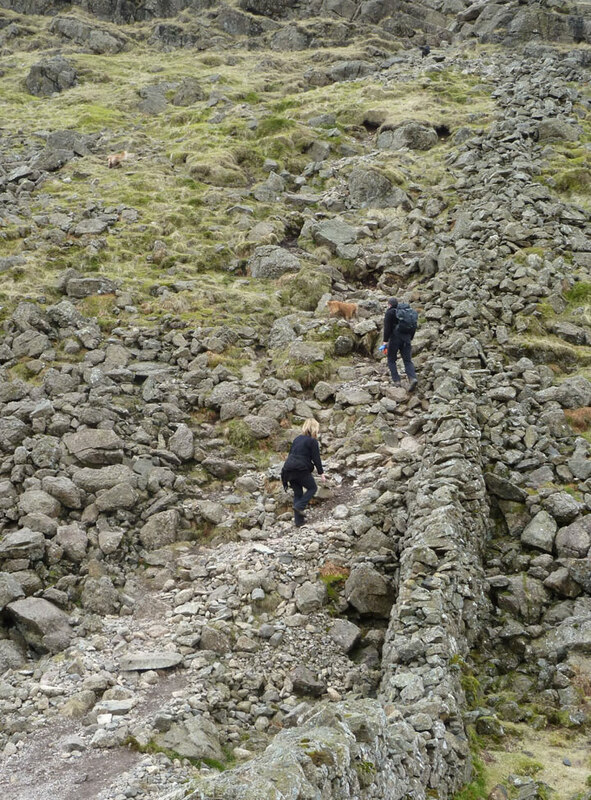 An odd bunch comprising three generations made hard work of the climb up by the wall, then a couple with three dogs recognised David and then Neil and then me. This was Lesley and Keith, new members of the OFC (later) and they had seen David on a previous walk and had seen Neil and myself on photos. 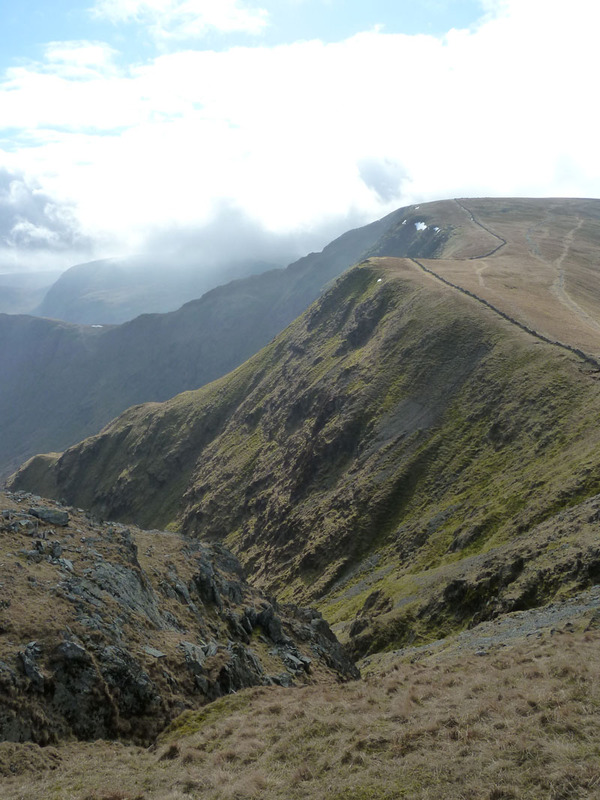 Walkers traversing from one side to the other, should note the change in rock type on either side of Threshthwaite Mouth. Just here we met Simon Howard, another friend from the OFC (still later). Simon was fellwandering and undecided as to where he was going. 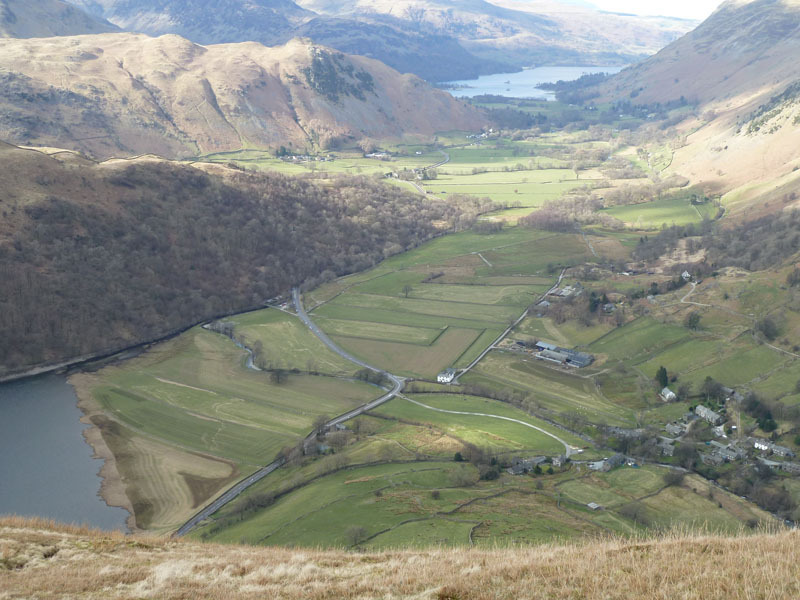 I offered him a lift back to his car at Troutbeck, so he joined us for the walk back to Hartsop. 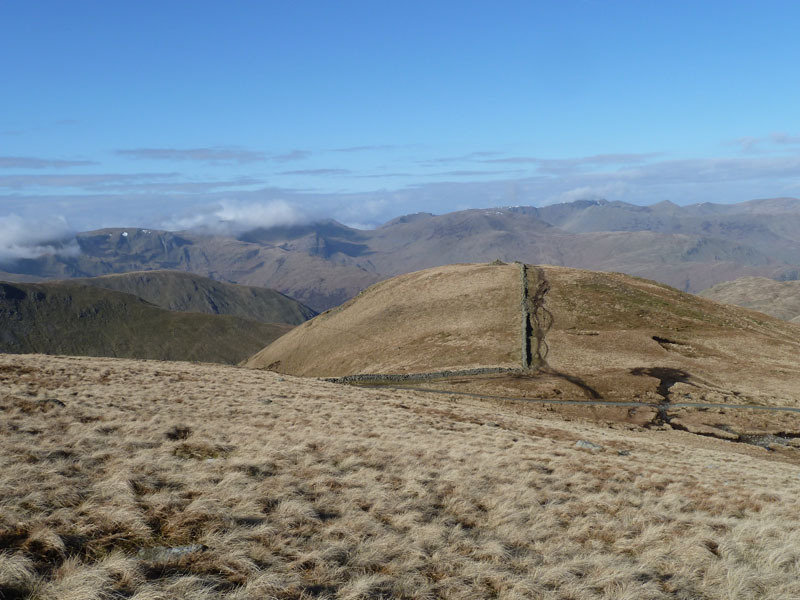 Not just a Borrow Pit, but THE Borrow Pit that Peter Wilson features in his book "Lake District Mountain Landforms". A borrow pit is a small excavation from where stone has been taken for wall or road building. If you only buy one book on Lakeland this year, buy this one. 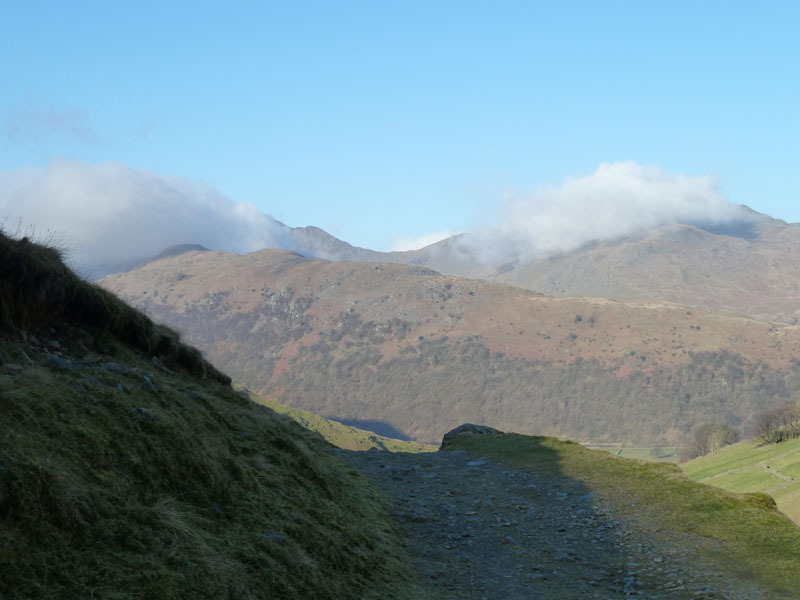 It's a very steep descent, or ascent - done it both ways now. I'm always thinking about stuff. 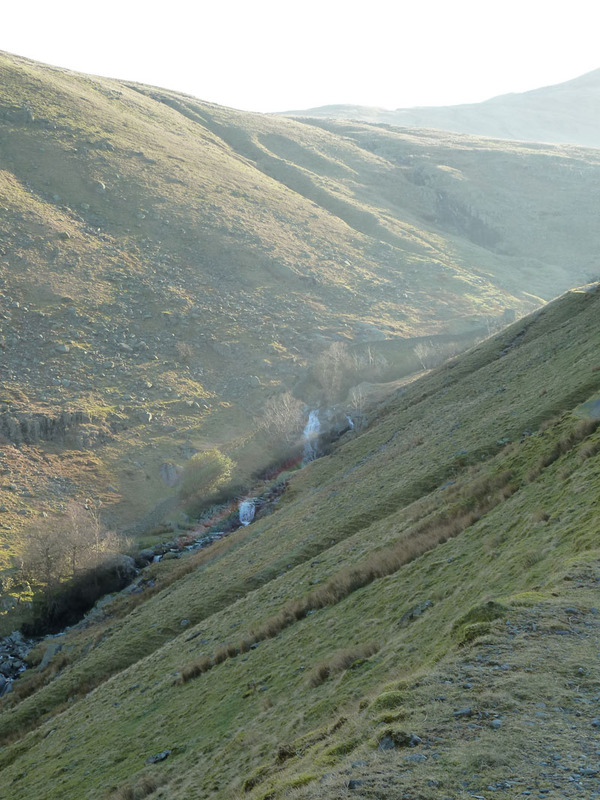 I wonder if the road between Cow Bridge and the bend at Hartsop is a later addition. 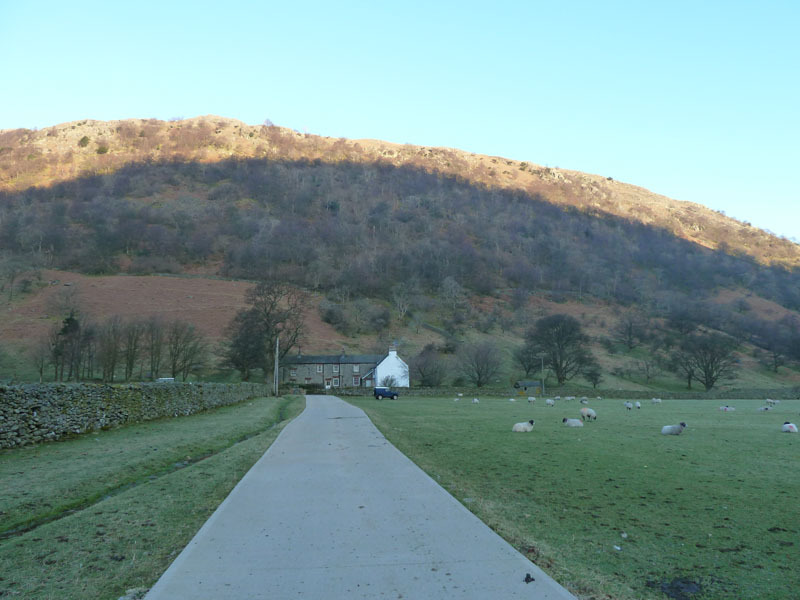 In th'old days, maybe there was one track leading from Patterdale to Hartsop Hall and another from Hartsop village to Patterdale. 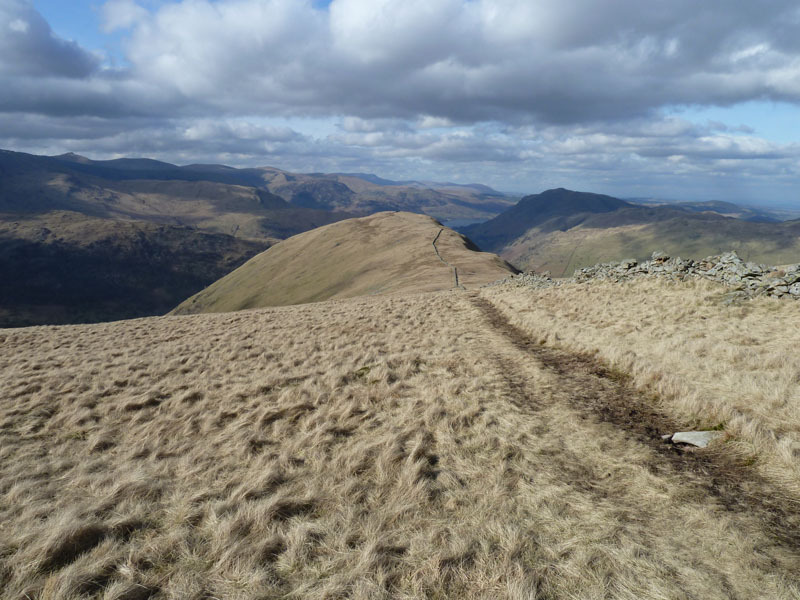 A really fine walk encompassing nine summits. Thanks to all who I had the pleasure of meeting and walking with. David Hall presented his version of the walk on his website, which he has now discontinued (2017) - such a shame, but that's how it is. The OFC (Online Fellwalking Club) is / was a home for kindred spirits. I'm not too sure if it still going, but I'm sure many friendships remain. 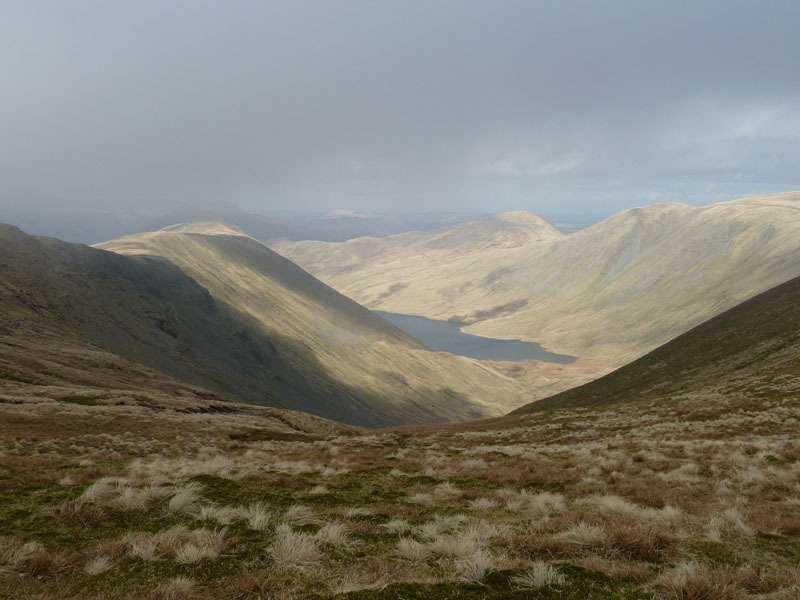 Time taken: My time from the tent was 8hrs 20mins over a distance of nearly 14miles; main walk 7hrs 30mins: 12.3 miles. Weather and conditions: Sunny start, clouds grew and plagued us for a while, but sunny intervals prevailed. Greetings Count: The greetings started on High Street. Plenty of folk at Threshthwaite Mouth, including Lesley and Keith and the disparate family of unhappy fellwalkers. 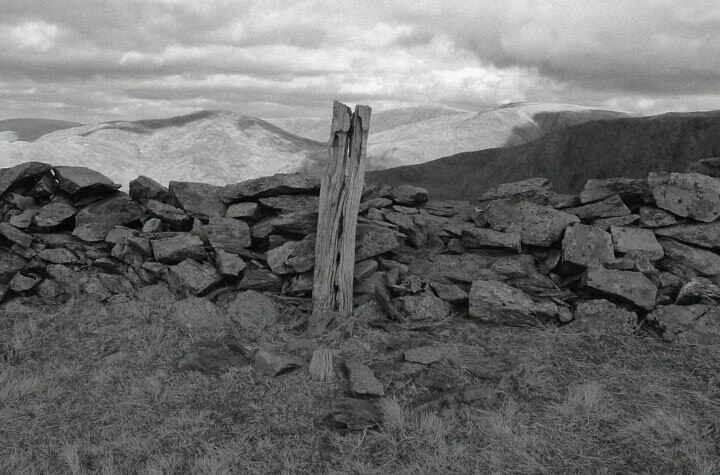 I have a lasting impression of a man at Thornthwaite Crag with an apple stuck in his mouth! We did see a helicopter later on, but hopefully he was not on board. 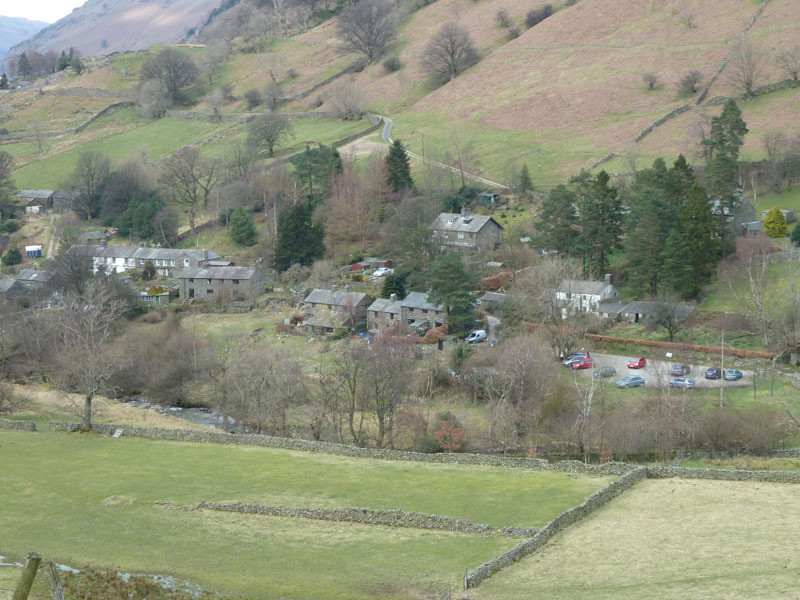 Richard's Refreshment Review: Neil, Simon and I had soft drinks in the Brotherswater Inn. We all had cars to drive. 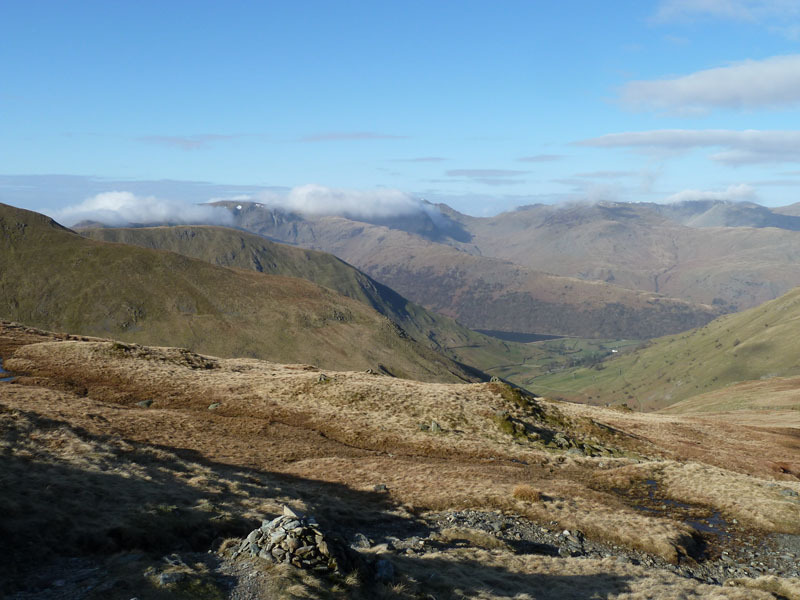 After fish and chips in Ambleside, I read a weather forecast in the window of The Climbers' Shop and decided the right thing to do was get back to Sykeside and pack up the tent. 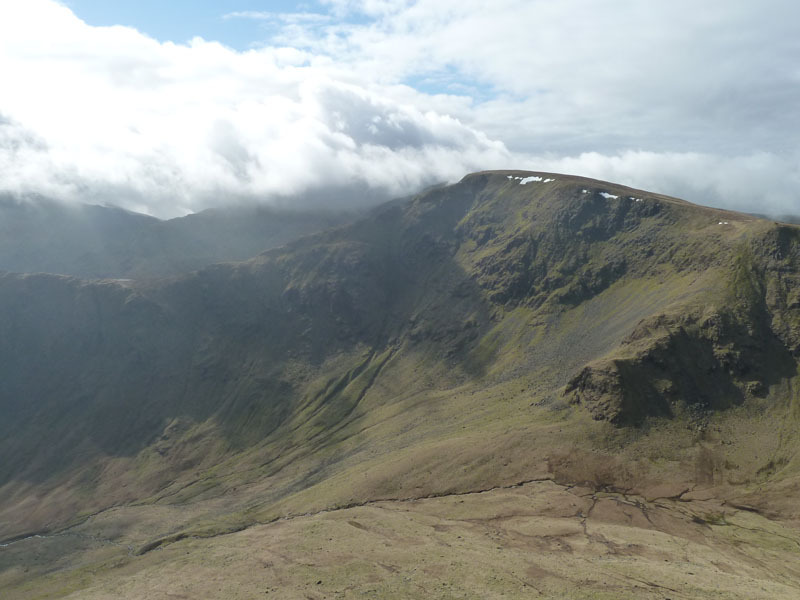 After two good walks, I didn't need a wet tent and low cloud walk on Sunday morning.